The 1oz. 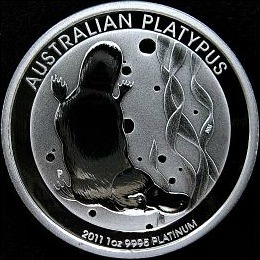 Australian Platinum Platypus is the first platinum bullion coin produced by the Perth Mint since it discontinued production of the Australian Platinum Koala in 2000. The platinum platypus bullion coin is struck from one ounce blanks of 99.95% pure platinum. The Platypus is one of the most unique mammals found in the world. 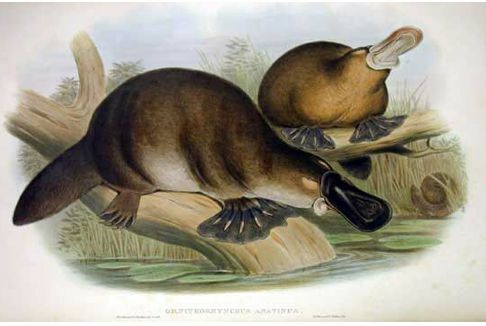 The Platypus lays eggs, is venomous, has a duck-bill, a beaver-tail and has webbed feet. The Platypus (Ornithorhynchus anatinus) is found only in Eastern Australia and lives near rivers and lakes, where they create burrows for shelter and protection. 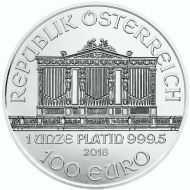 The obverse side of the 1oz. Platinum Platypus displays the profile of Queen Elizabeth II. The profile of the Queen was designed by Ian Rank-Broadley, the initials of the designer are found directly under the Queen's neck. 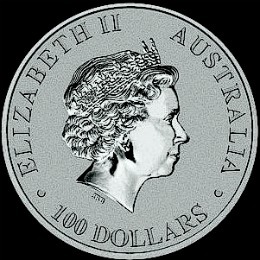 The Queen's name "ELIZABETH II" and "AUSTRALIA" are inscribed along the outer perimeter of the bullion coin. 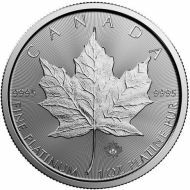 "100 DOLLAR" is the face value of the platinum bullion coin and is displayed along the bottom of the coin. The reverse side of the 1oz. Australian Platinum Platypus bullion coin displays the platypus in its natural environment. The Platypus is shown swimming underwater among aquatic plants. Across the top of the reverse side of the coin are the words "AUSTRALIAN PLATYPUS." 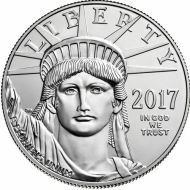 The bullion coin's year of issue, weight "1oz" and purity "9995 PLATINUM" are displayed along the bottom of each of the platinum bullion coins. The bullion coin has the Mint Mark of "P" representing the "Perth Mint", and is shown inside the same field as the Platypus design. 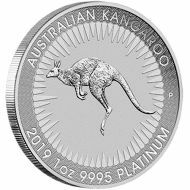 2018.....The Platinum Platypus was discontinued and replaced by The Perth Mint's New Platinum Kangaroo bullion coin here.